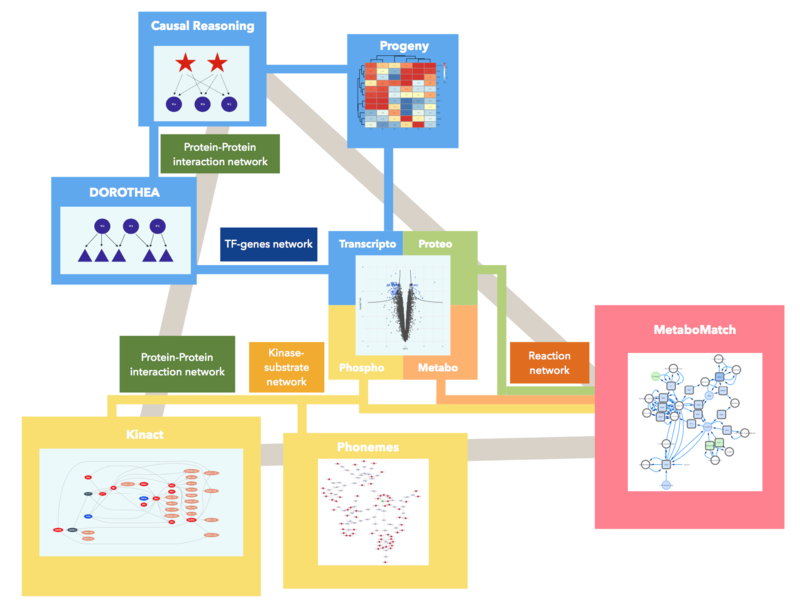 Mathematical models are usually built and validated in the context of studies focused on a specific molecular layer (typically signaling, metabolism, or gene regulation) and based on a single type of omic data (transcriptomic, metabolic, (phosphor)proteomic). However, in the biological reality, the distinction between these molecular layers disappear as proteins, metabolites and nucleic acids are all deeply interacting and influencing each others. Therefore, in order to better understand the interplay among these processes , it is critical to develop models that are able to span over multiple omics layers and account for trans-omic interactions. 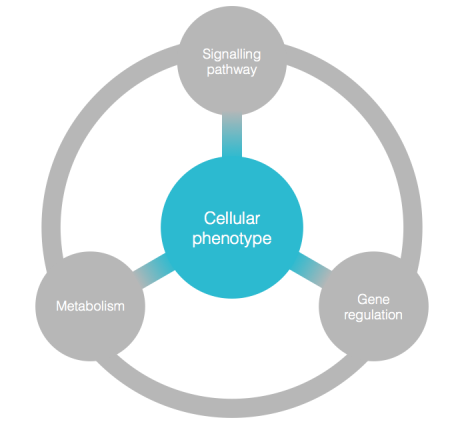 Schematic representation of the interactions between signaling pathways, metabolism and gene regulation the result in specific phenotypes. We are specifically focusing on trying to bridge together signaling pathways and metabolism through the development of models integrating transcriptomic, metabolomic, proteomic and phosphoproteomic data. The first step of such an approach usually requires the extraction of functional information from abundances measurements available in omic data sets, such as kinase or transcription factor (TF) activities using prior knowledge about the possible interactions between TF/kinases and measurements using Dorothea (Garcia-Alonso et al. 2018) or Kinact (Wirbel, Cutillas, and Saez-Rodriguez 2018) tools . These signaling pathway regulation events can then be correlated with changes in metabolite concentrations in metabolomic datasets. We have recently used this an approach (Gonçalves et al. 2018, 2017) to discover new regulation metabolic regulation mechanism in yeast and cancer cell lines. Recently, we started developing methodologies to expand these activity estimations to metabolic enzymes (MetaboMatch). The second step consists in linking these activity changes and/or significant abundances changes between condition together or with specific perturbation. This can be done with the help of tools developed in our lab such as PHONEMeS (Terfve et al. 2015), that use specific model training strategies to find active pathway linking perturbation/deregulated kinases with measured phosphosites. We are now working on integrating more diverse type of omic data and activity estimations. Overview of the multi-omic model integration pipeline. Each tool requires specific omic input. Colour path represent direction interactions between tools, while grey paths represent overall interactions between them. Research in this area is partially funded by the European H2020 MCSA Innovative Training Network SyMBioSys. Garcia-Alonso, Luz, Francesco Iorio et al. 2018. “Transcription Factor Activities Enhance Markers of Drug Sensitivity in Cancer.” Cancer Research 78 (3): 769–80. Gonçalves, Emanuel, Zrinka Raguz Nakic, Mattia Zampieri, Omar Wagih, David Ochoa, Uwe Sauer, Pedro Beltrao, and Julio Saez-Rodriguez. 2017. “Systematic Analysis of Transcriptional and Post-Transcriptional Regulation of Metabolism in Yeast.” PLoS Computational Biology 13 (1): e1005297. Gonçalves, Emanuel, Marco Sciacovelli, Julio Saez-Rodriguez et al. 2018. “Post-Translational Regulation of Metabolism in Fumarate Hydratase Deficient Cancer Cells.” Metabolic Engineering 45 (January): 149–57. Terfve, Camille D. A., Edmund H. Wilkes, Julio Saez-Rodriguez et al. 2015. “Large-Scale Models of Signal Propagation in Human Cells Derived from Discovery Phosphoproteomic Data.” Nature Communications 6 (September): 8033. Wirbel, Jakob, Pedro Cutillas, and Julio Saez-Rodriguez. 2018. “Phosphoproteomics-Based Profiling of Kinase Activities in Cancer Cells.” Methods in Molecular Biology 1711: 103–32.